Designing the modern day car has become an extremely complex problem. Not only must the car be pleasing to the eye, but it must be comfortable, reasonably priced and fuel efficient as well. Based in Winterthur, Switzerland, Rieter Automotive Systems is one of the leading global suppliers of systems solutions in the field of noise control and thermal management for the automotive industry. Rieter Automotive Systems offers innovative solutions within a Total Vehicle Approach to make cars more comfortable, lighter and more efficient. To achieve their goals, Rieter uses CFD, together with radiation analysis, to support its business units in thermal shielding, engine undertrays and underbody covers. Rieter also offers research in new thermal/aerodynamic packaging concepts for the whole vehicle focusing on better control (mixing or splitting) of hot and cold airflows. To do this, detailed underhood and underbody vehicle models are required. With the help of Harpoon, the extreme mesher developed by Manchester, UK-based Sharc, Rieter has been able to make complex full car model creation a much more simple task than with previous methods. Harpoon is a fully automatic hex dominant mesher, which can mesh complex geometries directly from the raw CAD without the need for a surface mesh. These unique features combined with an industry aware, enthusiastic development schedule have led to Harpoon being a revolutionary tool within the automotive sector. Rieter uses Harpoon to create detailed meshes including boundary layers (important for heat protection work) on the full car. 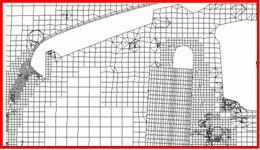 Typical meshes consist of 7.5 million cells with a cell resolution of 20mm in the wake area. This leads to a good aerodynamic solution. One of the most important areas of work is drag reduction. Rieter uses Harpoon to help with this. A production car with two different underfloors (see images above), were compared. A drag reduction of 10% (Cd 0.33 to 0.30) was discovered using Harpoon with a new, flatter underbody concept. “Harpoon is a very useful tool for performing multiple-case studies, because it is easy to modify the geometry and then re-mesh everything automatically in 5 minutes”, Edward Bendell, Thermal CAE Specialist, Rieter Automotive Systems.